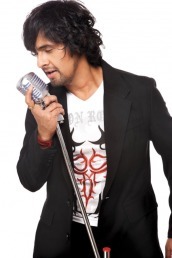 In an industry infamous for its blatant nepotism and “casting couches”, Sonu Nigam has emerged as a bright and shining star, with scrupulous passion and ethics built on his unfaltering dedication to music and commitment to improve and grow not only as a singer, but evolve into a consummate musician and performer. Today, no introduction of Sonu Nigam is anything short of a never-ending string of appellations, moniker, titles and honors. Indeed, he is not only the voice of our generation but the generation that grew up admiring singing greats of the yester years like Kishore Kumar and Mohammed Rafi. With his relentless desire to evolve and better himself, Sonu has not only transcended genres of music ranging from folk, classical, semi-classical, pop and rock but has perpetually delivered hits in more than six languages including Hindi, Marathi, Telugu, Tamil, Bengali, Punjabi and even English. With his ability to alter his voice to the mood and style of song, he makes us feel and believe what the lyricist meant, composer intended, the actor depicted and the director envisioned that song to be.